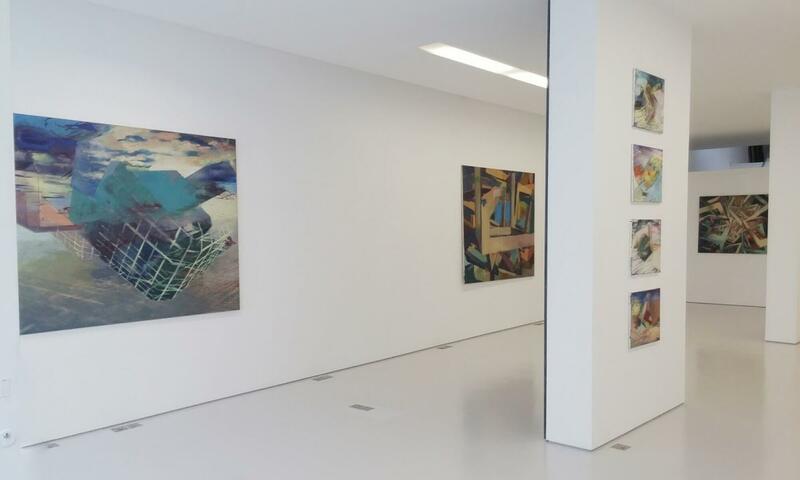 We are pleased to announce the showing of “Cubic Worlds”, Christoph Kern’s first solo exhibition at Filipp Rosbach. Christoph Kern uses old master knowledge of the material of painting with almost scientific obsessiveness to ‘breed cubes’. In his investigations he follows various tracks: cubes imploding in space, gyrating in science - fiction - like structures that evoke connotations like Star Wars or Kubrick’s 2001. Or monolithic cubes that seem to all but eliminate pictorial space in their attempt to push towards and flow over the edges. And, most recently, a focus on futuristic landscapes that appear to have been generated by the cubes themselves, yet in which the cubes tend more towards dissolution. Kern’s paintings are an accumulated history of their own making. They are built up of many layers, beginning with the initial scenario under investigation, setting the scene. With each progressive layer, the cubes’ evolutions, their growth, colour, position and movement in space as well as their relationship towards each other is traced, the positions at which they arrive are tested and pushed towards a point at which the image can rest. This stage is documented before the painting process continues. Pentimenti and animated films show the different stages of one painting’s transformation and are a way for the viewer to share in its evolution. In ‘Pica’ cubes crowd their way into the painting and cluster around a bird’s - eye view of a plane in the distance that has asserted itself against an all but obliterated progenitor of the remaining hovering cubes. Yet traces of this ‘ancestor’ remain, making for another ambiguous play with the illusionistic potential of the painting: The erased cube’s top shows the sky’s reflection that seems to come from and announce an entirely different climate-zone. The crisp blue in this ambiguous field is so unlike the polluted atmosphere glimpsed in the background to the far right that one begins to understand that Kern not only confounds our expectations of coherence of space but also those of time. The seductiveness of that bit of sky oscillates between lending itself to be perceived as reflection or as ‘actual’ sky, a further opening-out, another window onto a different world. As though it were tempting us - like the Russian dolls principle - to yet another place. As in a picture puzzle this play with positive and negative space makes for an ambiguity that is inherently connected to Kern’s attempt to negotiate between the opposing forces of Baroque space and the Modernist representative of the rational - the cube. In his work, Christoph Kern confidently asserts the idea of the painting as a window to the world, the notion modernism worked hard to dispense with. When the cubes infiltrate the baroque stage-like landscapes, as representatives of the abstract and rational, the controversy over space is sustained and mediated by Kern during the painting process, thereby pitting the modernist tenet against a know ledge of the long history of painting that has gone before. For him the main challenge is not to ‘people space with cubes, but to push the painting towards a point when the cubes will have created their own environment’ and these two divergent ideas that were deemed to be incompatible will have undergone a transformation that has made for a world that as a painting is a believable, convincing entity. Publication: A fully illustrated booklet, edited by Jörg Rosbach for the Filipp Rosbach Gallery, with an essay by Nikola Irmer will accompany the exhibition. 1981-1988 Academy of Fine Arts, Munich. BFA, MFA. The gallery is open Tuesday to Saturday from 11am to 6pm. Josef Filipp, Michaela Rosbach, and Jörg Rosbach look forward to your visit. Nikola Irmer – Committed to spatial illusion.